David Cooley, the founder of The Abbey Food and Bar and Heidi Cortese of Leisure World are hosting the 13th Annual Christmas in September with cohost, LeeAnne Locken, BRAVO’s Real Housewives of Dallas. Event is taking place at The Abbey Food and Bar, 692 N Robertson Blvd. in West Hollywood is sent for Tuesday, September 25, 6:15pm. 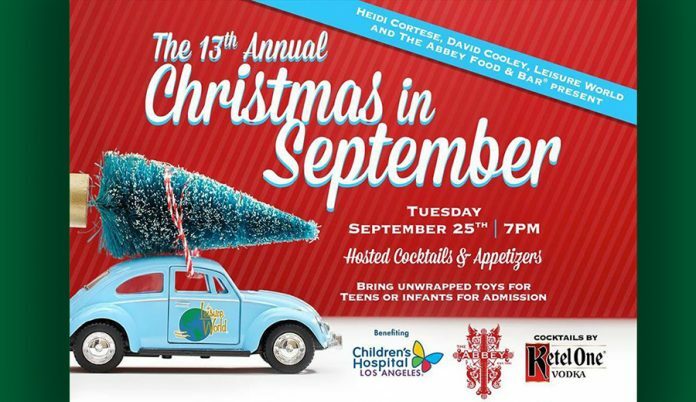 The 13th annual Christmas in September event benefits Children’s Hospital Los Angeles. Many people are generous enough to donate toys during the holiday season, but by September, the hospital’s supply runs extremely low. To be admitted into the event, guests must bring one unwrapped toy for a teen or infant to donate to the toy drive. 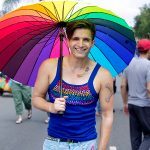 The Abbey will be transformed into a winter wonderland, including Christmas trees, sleighs, go-go dancing elves, shirtless Santas, and a red carpet where it snows at the entrance. Children’s Hospital Los Angeles (CHLA) is a 501(c)(3) nonprofit institution that provides pediatric health care and helps our patients more than 528,000 times each year in a setting designed just for their needs. Our history began in 1901 in a small house on the corner of Alpine and Castelar Streets (now Hill St. in Chinatown) and today our medical experts offer more than 350 pediatric specialty programs and services to meet the needs of our patients.